SPOOKY SEASON is here! While the nights get darker, costumes are being chosen and sewn right across the country; pumpkins are carved and placed on the windowsill, and treats are being baked (and bought) for all the trick or treaters who’ll ring the doorbell. Meanwhile, we’re busy in the kitchen coming up with some ideas to make some favourites into something suitable for the October 31! 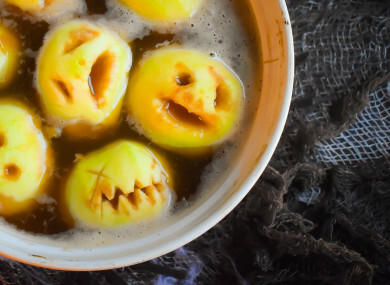 It’s all about making food and drinks look spooky, scary unnerving and we think these recipes do just that: a mouldy-looking dip, a cauldron of heads, and squidgy brownies! Everyone has their own recipe for guacamole, and arguably this isn’t a seasonal recipe in any sense. However, there’s something so satisfying about making food blue on this particular night of the year and we couldn’t be happier to turn the healthy eating ingredient of the moment, avocado, into a mouldy, slowly decomposing dinner party starter or pre-drinks nibble. YUM! The gorgeous green of guacamole is the perfect vehicle for spooky silliness in the form of a liberal crowning of artificial mould. Feel free to cut some tortilla wraps into some Halloween shapes, and even paint using some water mixed with paprika for an extra effect. Firstly, for the mould, simply combine the Panko and the food dye. You can use a mix of blue and black food colourings if you like, in order to get that darker blue hue. Or you can add some Worcestershire sauce to blue dye to make it a darker colour. Make your own guac. People are quite particular, so whether you want lots of garlic, no tomatoes, heavy seasoning, a dash of Tabasco or a super secret ingredient – do it your way. We don’t need to tell you how to mash together these ingredients, do we? Sprinkle half the mould over the guacamole and stir to combine, then finish with a light sprinkling over the top. This is the stuff of Pinterest dreams… or nightmares! If you’re beyond bobbing for apples, this might be a nice idea instead, which allows your creativity to run wild! The punch itself can be customised in whichever way you like too. After finishing each carved half, douse again in the juice to ensure that the freshly sliced bits don’t discolour. When each apple half is carved and complete, set aside and get a big glass bowl. Pour in all of the cola (or you could use concentrated squash, alcoholic cocktail or even a mocktail). You can then slightly tinge with food dyes and colourings if you like, which gives an even more menacing murk to the shrunken head bath. Our version of this classic recipe has a beetroot base, providing colour, earthiness and a deep punch to the palette which is followed up by the tart, fresh burst of raspberry, both speckled whole throughout and swirled and stirred through the chocolate middle. These are fantastic for sharing, but, you would also be forgiven for wanting to be alone with this tray of complete indulgence if you’re feeling particularly low or in need of edible comfort. Pre-heat the oven to 180°C. Line a 22cm square springform tin with parchment paper. Put a glass bowl over a pan of simmering water and melt the chocolate and butter together. Meanwhile, peel and grate your raw beets into a small bowl. Keep all the juice that leaks. In another bowl on standby, combine your dry ingredients – flour, bicarb, baking powder, salt and cocoa powder. To make the raspberry purée, simply mash raspberries with a little salt and sugar until it becomes a very loose jam consistency. Now to your main bowl. Sift the sugar into the eggs and whisk until the mixture is pale, light and fluffy. Give it a good two minutes work. Then add your beets, stir all together as the mixture becomes wonderfully pink. Add your dry mix and chocolate mix alternately, beginning and ending with the dry. So in your head judge your dry mix into quarters and your wet mix into thirds. Add a quarter of the dry mix to the big bowl, stir, add one third of the chocolate, stir… and so on until everything is combined. Just as everything has come together, lightly stir in the raspberry purée. Pop on a baking sheet and bake for 25-30 minutes. You want the top to be ever so slightly cracked and firm, but still gooey inside. Cut into six or eight slices and serve. Email “Shrunken head punch, anyone? 3 gruesomely good ideas for a Halloween feast”. Feedback on “Shrunken head punch, anyone? 3 gruesomely good ideas for a Halloween feast”.